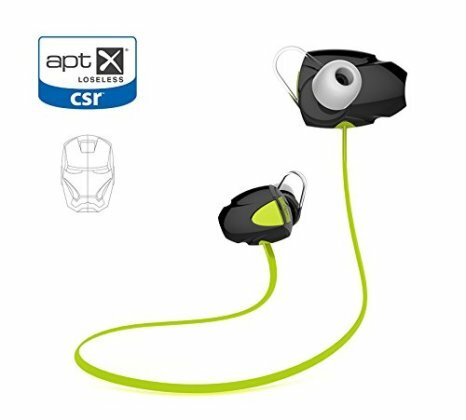 Amazon.com Coupon, 51% off ZIOCOM Iron Man CSR Bluetooth 4. With the most advanced CSR Bluetooth 4.1 chips hardware configuration, the Iron Man headphone ensure Hi-Fi CD quality stereo music sound.Leading apt-X Tech Can Provide No-lag Voice when Listening to Music or Calling with Mic. Exercise-proof & Sweatproof design guarantee 100% Stable and Comfortable when exercising, running, climbing, driving, skating, camping, fishing and other outdoor sports. Small, middle and big size earhooks included. Strong Wireless Signal: you can enjoy skip-free music in a 10-meter working distance, even if use your music devices left/right side, above/below waist. Up to 6 hours of continuous talking / music time; easy and fast pairing with smartphones, tablets and other Bluetooth enabled music devices. Two-link: can connect two Bluetooth devices at the same time. This gives you double the possibilities for answering calls and streaming music to your workout headphones, all while enjoying premium Bluetooth earbuds wireless sound quality. Automatically connect back function: it can reconnect to your lastest paired device automatically.